We’re nearing apocalypse if I’m out here carrying water for Fox News’ Tucker Carlson, who is hopefully not being water-boarded as I type this. 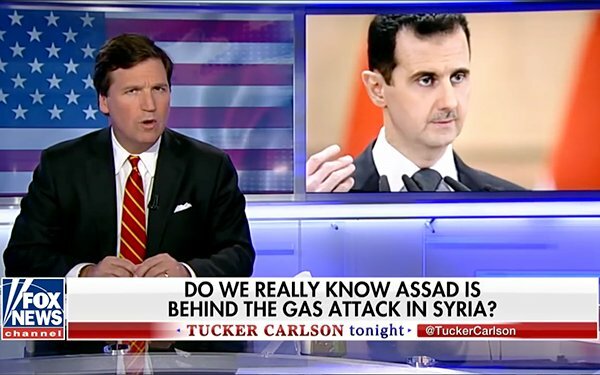 Last week, after a series of controversial prime-time episodes of “Tucker Carlson Tonight,” which questioned whether it is in America’s best national security interest to overthrow Bashar al-Assad in Syria; what the ultimate end-game looks like, considering the post-coup mess America’s made of Libya and Iraq; and if the recent alleged chemical warfare assault on children was actually the work of Assad or even if it happened —Tucker Carlson was M.I.A. from his own show Wednesday, Thursday and Friday nights. Without anything in the way of notice, either. I wasn’t sure which was weirder: That he just vanished, or that nobody talked about it. Usually, the disappearance or disgrace of a Fox News stalwart gets a few laps around the track from its many critics. I should know, since I’m one of them. When Bill O'Reilly went on his (permanent) vacation, given his predatory sexscapades, we got thousands of inches of speculation that his end was near. More recently, when Fox’s Laura Ingraham blew the perfect opportunity to constructively debate the intellectual validity of elevating a bunch of traumatized high-school students to America’s irreproachable conscience, by insultingly sticking both feet in her mouth, there was much tsk-tsk-ing and endless speculation about whether her subsequent sudden vacation was scheduled. But Tucker Carlson gets ghosted after a week pounding holes in the Syria story and there’s ... nothing. Nada. Zip. The only pundit on television who is not lock-step with the “Assad did it and we need to invade, STAT!” and even invited the Permanent Establishment’s least favorite journalist, Glenn Greenwald, on air to discuss why the media was hell-bent for war — was taken off-air in the middle of the week. If you’ve got a few minutes, head over to alleged media watchdog/gossip sites — left or right, it doesn't matter — Media Matters, Breitbart, the ironically named Reliable Sources, Red State, Huffington Post, Variety and Hollywood Reporter. Any mention of Tucker Carlson’s sudden disappearance is conspicuous by its absence. Is that really where we are as a country? That the only corporate media guy who questions the Establishment narrative about yet another heedless rush to war and further f#cking up of one of the most volatile spots on Earth, can go totally dark (Carlson’s usually busy Twitter feed has likewise gone silent), vanish without explanation, and nobody says anything? If you’ve got any doubts there just might be marching orders from points unknown to trusty talking heads in the field, we’ll turn to the BBC, still one of the most trusted media sources in the English-speaking world. Last week, during a BBC interview with Admiral Lord West — former head of the freakin’ British Royal Navy — the Admiral cast doubt about the veracity of the chemical attack. He didn’t call it a “false flag.” He didn’t say Assad didn’t do it. All he said was that sometimes intelligence can be wrong, there are lot of agendas in play, and perhaps cooler heads should prevail and do a bit more study instead of rushing to kill more people. A former commander of British Armed Forces tried saying something similar, and he got interrupted and shut down by Sky News. A recent study by FAIR of the top 100 circulation newspapers in the U.S. found a grand total of zero thought the bombing was a bad idea. Some 26 thought it was good; 74 had no opinion. That’s a far greater percentage than Americans in general, according to a formal CBS poll.